Lun-Dun – I like how the foochows say London. I understand many other Chinese dialects also pronounce London as Lun-Dun though the tone may vary. The High Commission of Malaysia in London had – on behalf of the Chief Minister – extended an invitation to various NGOs for a briefing session – with the stated purpose to provide the participants with an understanding of what Sarawak has to offer in terms of environmental management and preservation, besides exchanging ideas and exploring potentials for collaboration between the NGOs and Sarawak. For many years, Sarawak has been the target of international environmentalists regarding forest management and conservation. The state has all this while avoided a confrontation with these green activists even amidst demonstrations on international front and through the local communities. Would not an invitation for “exchanging ideas and exploring potentials for collaboration” sound too good to be true? No, the Chief Minister did not bow too low. On the contrary, he spoke with authority. “If your agenda is truly conservation and sustainable management of our forests, if that indeed is your agenda, we are prepared to work with you. If your agenda is something else, I am sorry I can’t work with you in good faith. And to put an end to the exchange with Rewcastle Brown, the Chief Mnister said in his usual no-nonsense way: “I don’t want to enter into an argument on this matter. We can argue until all the cows come home and not come to any conclusion. When James died last November, I bought a few of her old books with the help of a dear friend who is a regular customer of Amazon-com, and revisited them over the past few months. Reading James’ fiction now is very different from doing so when I was much younger. Back then, the fascination was probably the meticulous construction of the plots with all sorts of good twists and turns. And, of course, the characters were an attraction. James’ Metropolitan cop, Adam Dalgliesh, is the most intelligent police officers in fiction I have ever read. Dalgliesh is sensitive, intelligent, awe-inspiring and is even a published poet. I did wonder what sort of woman would be good enough for him. But there is no romance. My biggest pleasure of re-reading those favourite mysteries is their power to transport me into a world of people, places and objects. A Certain Justice was set in the London Inns of Court. James also used her knowledge of the Anglican Church in her setting of Death in Holy Orders. But more to it, as a mature reader now, I see Dalgliesh as a realistic cop, dedicated and skillful, not just a policeman, but a complex and sensitive human being. But most of all, you realise that any of the events in James’ books could have happened in real life. James agreed, in an interview, she had said what her stories were about was not murder but the restoration of order. James was not only a writer living in her own world, she kept in touch with the criminal classes by sitting as a magistrate in London and active in politics. 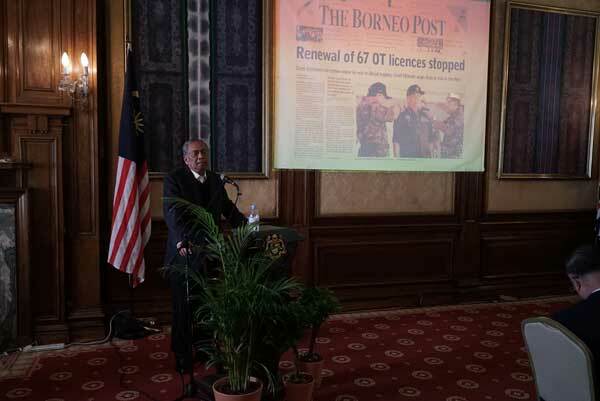 By the same token, it could be said that in an effort to restore order vis-a-vis forest and conservation policies in the state as well as world views of our forest management, Adenan is like a hero who appears on the international front of Lun-dun to begin his works of overhauling the mess to proper order. So, I say, Adenan rocks – he is making every effort to bring order out of disorder – both in our DUN and Lun-dun. In passing, here you are, for all mothers, and fathers too, a Happy Parents’ Day. Love, always love. Perhaps that’s what we’re all looking for. And if we don’t get it early enough we panic in case we never shall. A Certain Justice, PD James.